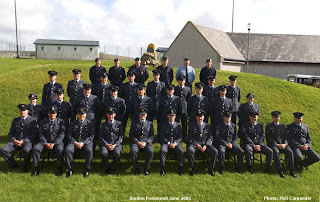 After nearly 50 years of operational life RAF Saxa Vord closed on 1st March 2006. The base had been a key influence on the islands economy and way of life for over half a century. Although the station did not open until September 1957 there had been servicemen and civilians working on its construction as early as 1954. The closure had a major effect on the local community - employment, schooling, property prices etc were all hit badly. Even for the resilient Shetlander it has had a significant impact. In a future section I hope to cover this impact in more detail and look at attempts to improve the situation on Unst. The next picture was taken more than 6 months before the closure but it was the last time that station personnel gathered for a formal photograph. The next sequence of pictures shows the closing ceremony itself. 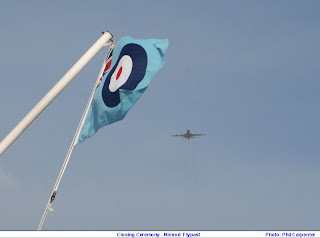 An RAF Nimrod maritime Patrol Aircraft flew past as the RAF Ensign and Station Commanders Pennant were lowered for the last time. The Ensign and Pennant were then carried to the Station Commander Sqn Ldr Phil Carpenter by MOD Guard Ian MacKay. Sqn Ldr Carpenter then presented them to Pam Mouat and Brian Gregson for safekeeping. 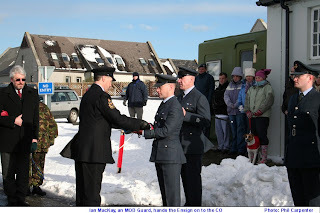 Pam Mouat, an Unst resident, was the last Civilian Personnel Officer on the Base and lived close to the camp. Brian Gregson represented Unst as a councillor on the Shetland Islands Council and it was particularly appropriate that Brian should have been there. He served 2 tours at Saxa, the first in 1978/ 79 and the second as Station Commander (Jul 89 to Sep 91). His name also appears on the Red Star Board which features earlier on this blog. The RAF's most northerly station closed this week – under the watchful eye of a Nimrod Maritime Patrol Aircraft from RAF Kinloss. Flypast by a Nimrod Maritime Patrol Aircraft from RAF Kinloss. RAF Saxa Vord on Unst in the Shetlands – the northernmost inhabited island in the UK with a population of about 700 - was a pivotal link providing early warning of air threats to the UK for more than 30 years and as such was a frontline Cold War station. Its mission was to assist RAF fighters intercept long-range Soviet bombers entering UK airspace, shadowing them as they tested the reactions of our air defences until jets such Lightnings, Phantom F4s and more recently Tornado F3s escorted them "off the premises." It was a game that might have had more serious consequences had the RAF not responded within minutes each and every time UK airspace was penetrated without authorisation. Had the Soviets not been intercepted before the bombers' theoretical launch point their political masters at the Kremlin might have believed they could launch a successful attack on UK cities. The intercepts of bombers and reconnaissance aircraft, with RAF Saxa Vord helping co-ordinate the air response, happened on an almost weekly basis from the 1960s until the Berlin Wall came down in 1989. Mrs Pam Mouat, the Station's Civilian Personnel Officer, is presented with the RAF Ensign and the Station's Commander's Pennant. 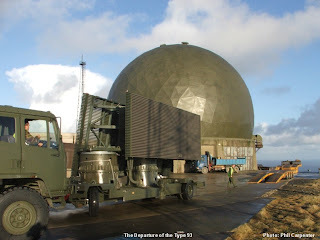 The station continued to provide air defence radar coverage for the next fifteen years but modern radar systems gradually reduced dependency on fixed installations and last year it was announced that the long-range radar cover provided by RAF Saxa Vord would no longer be required. At a ceremony the RAF Ensign was lowered for the last time and it and the Station's Commander's Pennant, were presented to Mrs Pam Mouat, the Station’s Civilian Personnel Officer, who accepted it on behalf of Unst islanders. "It's the end of an era. Today was a solemn but quiet end to the radar cover from Saxa Vord and closure of the station. We shall miss the warmth and generosity of the islanders. The RAF's presence here has been an integral part of the community for more than 65 years. Luckily the weather was kind to us during the ceremony with just a few inches of snow – we normally expect to get up to 5ft of drifting snow at this time of year." 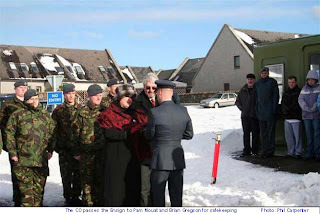 The last photo of this section shows Mrs Pam Mouat, the last Civilian Personnel Officer, symbolically locking the camp gates after the the RAF departure.